Anvers for the French-speakers, this historic city has been hailed by Elle Decor as Belgium’s ‘epicenter of edgy fashion and fantastic art’. Usually renowned for being the diamond capital of the world, Antwerp has indeed reinvented itself as a fashion city and attracts aspiring designers from all over the world, though the textile tradition is nothing new to the city that dominated the European wool trade centuries ago. Today, Antwerp gathers some of the world’s most famous fashion designers thanks to their edgy clothes (Dries Van Noten, Dirk Bikkembergs among others) but when it comes to interior designers, the cosmopolite city doesn’t lack in that department either. 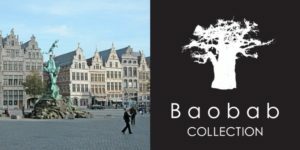 By opening up to new contemporary cultures, the city has become a place where talent meets innovation, with the emergence of trendy designer shops and studios, and Belgium in general has witnessed a successful export throughout Europe and beyond from Bellino’s lighting to Charrell’s large collection of furniture and home decor, and let’s not forget the Baobab Collection and its hand-made scented candles that can now be found on every continent. Art has always been a huge part of Antwerp and the city couldn’t show more support to the Royal Academy of Fine Arts as ‘Happy Birthday Dear Academie’ messages could be seen all over town back in June. Founded in 1663, the Academy ranks among Rome, Paris and Florence as one of Europe’s oldest art schools and has produced artists who shook up the art world like Van Gogh. It’s Antwerp’s devotion to fashion and art that has supported the creative culture within the city, leading to some of the world’s most creative and successful interior design studios, and even architecture. If you happen to be there, we highly recommend you to stay at the Hotel Julien, a charming and centrally located boutique hotel with a rooftop view and stop by the Flamant concept store for lovely gifts to bring home to your loved ones.